David had 2 careers in Fine Art Auctioning and Environmental Management before following his sister into Osteopathy. He graduated from the British College of Naturopathy and Osteopathy (now the British College of Osteopathic Medicine) in 2001, after 4 years of intense study. David developed a very successful practice at the White Hart Clinic in Barnes, London, which he left in March 2014 to join his sister on the Costa Blanca. He specialises in diagnosing and treating acute and chronic spine conditions, shoulder, hip and knee injuries and trapped nerves. He has treated national and international sports professionals, pregnant mothers, the young and the more elderly. He keeps his patients fully informed about their condition and their recovery. 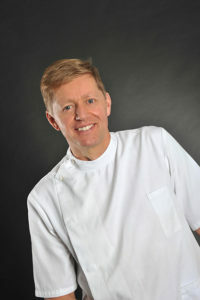 David skilfully uses a range of different techniques which he tailors to the patient’s needs. These include mobilisation and articulation of joints, manipulation and massage of muscles, tendons and ligaments, manipulation of the spine, fascial release and cranial osteopathy and rehabilitative exercises. David specialises in “micro-manipulation” of the soft tissues (muscles, tendons, ligaments and fascia), a detailed and precise treatment of all soft tissues. He aims to resolve the patient’s problems as quickly as possible. David is registered with the Register of Spanish Osteopaths (No. 474).